Some people have accused me of flip-flopping because I said that anybody in my administration who leaked Valerie Plame's name would no longer work in my administration but later said that anybody in my administration who committed a crime by leaking Valeria Plame's name would no longer be in my administration. To those people, I say that there is an old saying in Tennessee, at least it's in Texas, maybe Tennessee too: "fool you twice, I can keep on fooling you forever." For those who wish me to clarify my position, I can say this (thanks to Unka Karl for the wording). 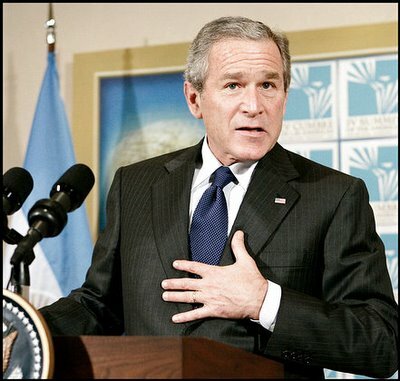 I promise you, hand on heart, that if somebody in my administration leaked Valerie Plame's name, and if that person is indicted for leaking Valerie Plame's name, and if that person is convicted of leaking Valerie Plame's name, and if that person is sentenced to death for leaking Valerie Plame's name, and if that person is executed for leaking Valerie Plame's name, then that person will no longer work in my administration. I promised, when I was selected in 2000, that I would restore honour and dignity to the White House. Unlike my predecessor, who refused to make this commitment, I pledge not to appoint dead people to my administration. Unless I learn the secret of reanimating the dead as zombies, of course.